We are building several in-depth lesson plans for classroom use to go with Space School! So take your class to see the film and follow up with our awesome educational materials! These lesson plans are free for anyone to use and provided as a .pdf file. Just <right click> and download to your computer. Special thanks to the Guy Harvey Ocean Foundation for sponsoring the lesson plan development! 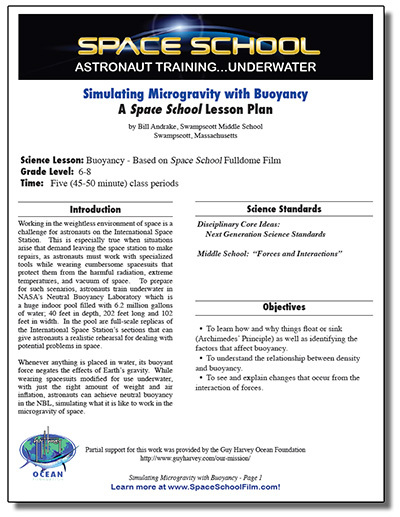 This lesson explores buoyancy, density and interaction of forces to explain how underwater training can simulate microgravity environments. "This lesson plan is awesome! It is a great fun way to involve kids in science, experimentation, collecting data and math." This lesson explores the concepts of heat transfer and refrigeration with hands-on activities, experiments and vocabulary activities.